Silver Trays are timeless, elegant and look classic and indulgent but can be completely affordable, especially on eBay,thrift stores and of course the Round Top Antiques Festival. I have never paid much, definitely not over fifty dollars and that was maybe on one or two. Some of my favorite silver trays and pieces I have found for less than ten dollars. 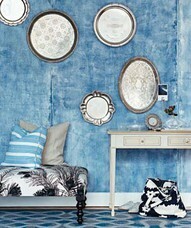 What a great look, hung in a grouping on a bold wall. I would love to do this in my home. Another beautiful silver tray. I do not have one of these trays with the raised pierced rim, I wish I did. They are my favorite and are also out of my price range. I have not found one yet for under fifty dollars (which would be an amazing, unbelievabe price), one day I will find one in my price range, until then I will admire the trays I come across and keep searching. Plus, a silver tray without a raised rim looks just as beautiful in a kitchen with any of your necessity. Another raised pierced rim silver tray, but again you could get the same look with a simple tray. A small rose bowl filled with flowers and a few other personal pretty items and this look makes a great addition to any bathroom or dressing area. I know this picture is of a buffet and more formal (looks incredible), I'm only offering additional suggesstions for a similar look in your bathroom, closet, entry way or bedroom, really a great tray (silver or otherwise) works in any room. This is a clever idea and adorable. I love it. Simple, tasteful and makes you look twice. The iron rack is originally used for towels but adding in the oval trays with a towel or two is an easy addition and makes a statement with easy and grace. A more conventional way to use a tray and who would dare say the look is not fabulous. What a cute, cute, cute grouping!!! A message board. Enjoy using your trays in any room and don't limit yourself on how to decorate with trays. 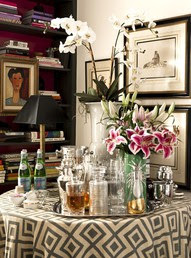 I also love silver trays and use them throughout my home. 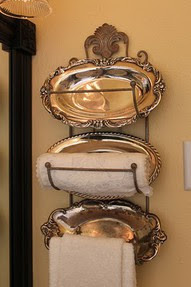 I especially like the idea of the towel rack to display the trays...wonderful idea! 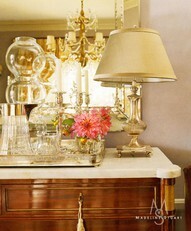 I also love silver trays, and use them throughout my home. 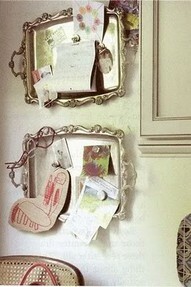 I especially like the idea of using a rack to display the trays; great idea!